Aconcagua Dispatch: January 19, 2019 – Nido de Condor! January 19, 2019 – Nido de Condor! Osvi calls us every day by satellite phone and the report continues to be good from the mountain. 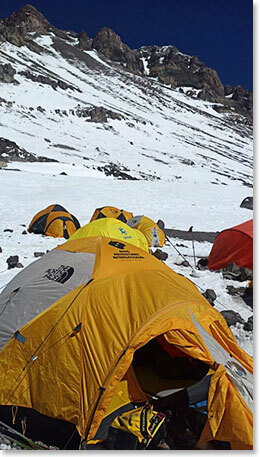 On Thursday Rick and John climbed with the guides to Camp II, “The Condors Nest” camp which is at 5500 meters, over 18,000 feet above sea level! The guys are sleeping well and their O-2 sats check out fine every morning. They are eating well and getting rest. 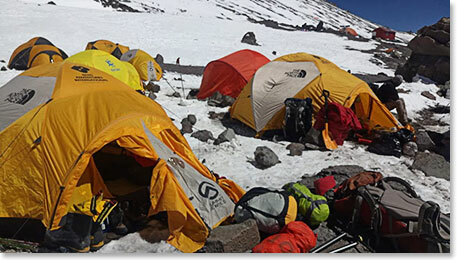 It is always windy to some extent on Aconcagua, but as these photos from Osvi will show the weather is basically beautiful. So today, Saturday, it was time to move to High Camp! They guys climbed up toward 19,000 feet steadily. Sunday morning they will start up again to spend the night at over 19,000 feet. Stay tuned and wish the team good weather. 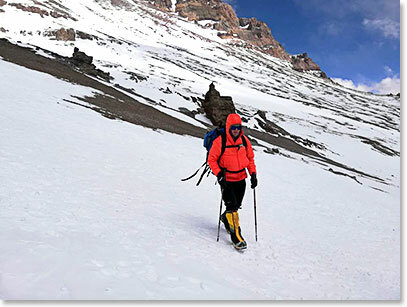 They have all the supplies they need in place at High Camp and Sergio, Maria and Osvaldo are preparing for a summit attempt for the team as soon as they feel ready. Tents from other teams as well are at Nido. The large red tent is where the Park Rangers stay. Good weather at Nido! A great sign for continuing higher one stage at a time.